I wanted to announce that I'm having success with MoM IME's editors in getting new units into the game. I've currently got graphics for 11 units finished, and I'll post images and descriptions a bit later. I've been wanting to do this for years, so thanks to Implode for making it possible and MoM IME so modular. So far, I've completed units for 2 new races: Goblins and Centaurs. They should be in a playable state sooner rather than later. Here's what I have so far. Each of these takes 33 frames. 462 total by my count It's fun though...and it'll be much more fun when I see these in game. Note that I only have Goblin Spearmen in the game currently, as I think it's wise right now to avoid adding this much to the game until there is a way to add it as a patch to another server .xml file. I saw that my Goblin Spearmen were in an .xml file that was the original MoM rules rather than Implode's fixes version, and right now I'm a little anxious about potentially wasting time doing that when I could be making graphics that I know will function at some point. And yeah, these are tiny...that's the way the svga crumbles. These descriptions are taken from my design document and serve as an introduction to these races. Goblins: The goblins are fantasy mainstays. Frankly, I was surprised that they weren't in the game upon its release. Goblins are small, greenish humanoids with distant relatives in the orcs. They have a short lifespan, during which their skin color can vary greatly, from the pale youth to the elder darker green goblins. They are known for their cruelty and their practice of slavery among other races, and those who appreciate those things get along famously with the goblins. They are also rightly known for their rabbit-like birth-rate. It is joked that each goblin female gives birth to a raiding squad every Spring. Internally, goblins value craftiness, invention, and self-sufficiency. On wars and raids, the goblins favor their greater numbers, the teamwork of specialist warriors, destructive magic and siege specialists to win the day. There is a subrace of goblins, the hobgoblins â€“ who emphasize militarism and discipline, and show each when they take the field. The major weakness of the goblins is their lack of late-game buildings for advanced magical production and research. Spearmen â€“ Goblin spearmen are made up of young males, knowable by their pale skin, shaky morale, and thin limbs. Nonetheless, these are frequently thrown into battle for the extra numbers needed to win the day. Choppers â€“ Choppers are basic goblin warriors carrying a mixture of melee weapons, known most famously for a short, fat chopping blade often mistaken by other races to be meat cleavers. It is an easy mistake to make. Bowmen â€“ Goblin archers carry shortbows, with which they put arrows on target from afar not necessarily through accuracy, but through numbers. Hedge Wizards â€“ Hedge wizards are equal parts shaman and sorcerer. They revel in destruction and are known for their interest in necromancy in lieu of actually healing their allies. Sappers â€“ Sappers are diversely skilled engineers, capable of road construction, wall destruction, and perhaps a few other tricks. They carry crossbows to add additional firepower to goblin-kind. Wolfriders â€“ Goblins are the only race known to ride wolves other than Gnolls. While gnoll wolf-riders are often those with close ties to their warlords, goblin wolfriders are conscripted â€“ it's often difficult to train wolves that goblins are not to be eaten! As such, they wear lighter armor and are slower. Nevertheless, they are aggressive and bloodthirsty warriors capable of riding down most infantry units. Grapeshot Catapult â€“ The goblins' prized weapon of war differs little from the traditional catapult in schematic, but greatly in practice. It fires scrap metal, wood, garbage, and specially made flesh-ripping caltrops to thin out enemy ranks, though it does nothing against walls. Hobgoblins â€“ Heavily armored, well-trained, and wielding deadly pole-arms, Hobgoblins are slow moving shock troops, trained specifically for gate-crashing and field-combat with other infantry. Their order and discipline confuses most goblins, who nevertheless know a useful tool when they see one. They are rightly feared by beings twice their size. Centaurs Centaurs are woodland creatures who are half-horse and half man. Nobody, including them, can give answers as to their origins, but for hundreds of years they have formed strong and flourishing villages. Their populations grow slowly and they lack high level economic and magic research buildings. Centaurs dislike races they see as selfish or industrial to the point of harming the natural planes, which are most aside from the high elves, nomads, lizardmen, klackons, barbarians, and of course, their ancient allies the beastmen. Strengths include mobility, archery, health and resistances. Disadvantages include low numbers of members per unit, no destructive magics, no siege equipment, and generally low technology. Scouts â€“ Centaur scouts are woodsmen of the highest caliber. They are excellent trackers, capable of detecting enemy units from far away. They carry spears, which they can hurl into battle if the need arises. This is, however, all they carry, so they are ill-equipped for heavy fighting. Warriors â€“ Every healthy male centaur is a warrior at some point in his life. These young centaurs are the basic 'infantry' of the centaurs, wielding simple weapons with strength, speed, and honor. Archers â€“ Centaur archers are among the most skilled marksmen on any known plane. Being centaurs, they naturally avoid melee opponents, peppering them with accurate fire. Lancers â€“ Centaur lancers are cavalry among horse-people. Needless to say, they're good at what they do. They particularly excel at annihilating enemy horsemen. Druids â€“ Druids are devoted clerics of nature, leading the centaurs spiritually at home and providing supportive magic in the field. Though they can hold their own in a melee, their value lies in their spells and spell-like abilities rather than direct damage. Rangers â€“ The most revered of Centaur warrior classes. They are scouts, warriors, and archers, and they have the wisdom to use the right path at the right moment to lead the centaurs to victory. 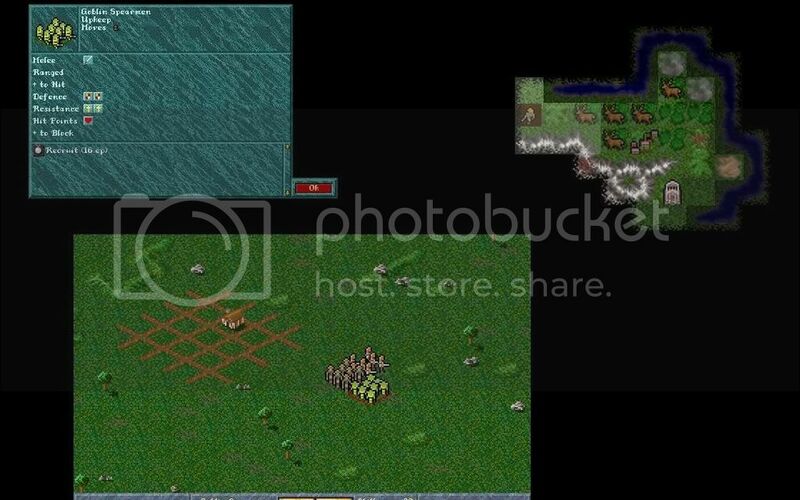 They will most likely have pathfinding, which will make the centaurs a mobile menace when they are well developed. Wow. Looks very good. Very much in the spirit of the original game which is a BIG compliment in my opinion. Thanks Esper. I appreciate that. This week I've created 8 more units, all belonging to a sentient plant faction, featuring entirely unique units apart from the standard spearmen/swordsmen/cavalry as well as having many tricks up their green sleeves. Example - instead of settlers they build a mass of spores, which are flying and invisible until they plant into the ground. I'll post images and descriptions of them when I get home in a few days. I appreciate all that Implode. Consider my work a vote of confidence in your own work. and LOL at the Bit-O-Moanders. I've played that but I didn't recall those...must have forgotten it in the hail of Vargoyles and a demi-god towards the end there Some great games, those Gold-Boxes. In any case, I've added more units to the link above, most prominently the Sylves (derived from the adjective Sylvan). If you look around, you'll see the race I'm currently working on. Names of units, ideas for their strategy, and the specifics of their stats are all quite easy to change, but the aesthetics are in place. This makes 26 units total I've made, which is 858 graphic frames so far, if anyone's counting To get a real glimpse at the units at MoM scale, just save them to your desktop and zoom zoom zoom in. And yeah, this is still just a teaser. Only one unit is in-game at the moment, and they're not very powerful lol. As a guide to the graphics, they originally come with a bright pink background, so I've spared you those by picking one glamor shot of each unit. Bright green at the base of a unit indicates a shadow in game, and 3 other shades of green (such as on shields, tunics, or banners) indicate colors that the game will replace with your wizard's colors. I present another cut from my design document, describing the new units of the Sylvan race. Sylve (adjective form: Sylvan) â€“ From the thickest forests of Arcanus, within a veritable node of nature, the plants awoke with life unlike they possessed previously. They gained the gifts of thought, from which sprung movement and better still â€“ purpose. They changed themselves into many forms as they began to expand and make sense of the world around them. It has been decades since this event, known as the Awakening. Their society is organized around those who have the most independence and are capable of the most complex thoughts. Their field units have been coaxed from breeding projects to have unique abilities that work well in unison. When plants go to war, they do so to protect themselves and their allies and to punish obvious enemies of nature: high men, dwarves, orcs, and dark elves. Their primary advantage lies in their diverse units with unusual abilities â€“ often featuring regeneration and poison â€“ and having basic units which do not require gold to sustain. Disadvantages include low birth rate, low technology concerning economics and religion, few ranged options, slow units, and minimal sea-faring capabilty. Great Spores - â€œHow on Arcanus did that get here?â€ Great Spores are a mass of extremely fertile seed-spore hybrids. They fly through the air at great speeds and bore into the earth to sprout new Sylvan colonies. They are nearly undetectable and very difficult to disperse until they plant themselves into the ground. Mylins â€“ Mylins are fungoid Sylve allies, which are semi-intelligent mushroom-men with long limbs which they use to move as well as fight. Though a Mylin soldier is nothing to fear for most of Arcanus' warriors, Mylins regenerate, often surviving dozens of battles and gaining some skill before they are put to rest. Featherspines - â€œThe javelin only grazed his arm, but as we woke at dawn he had been dead for hours.â€ Featherspines are walking batteries of poisonous javelins. They are little more than tools of war, so their status in Sylvan society is quite low. Their value on the battlefield is quite the opposite, as they are the primary Sylvan ranged units. Thorncrowns - â€œFighting a thorncrown is like fighting two flying cobras that can't feel pain simultaneously. You might win, but you won't live.â€ Thorncrowns are spiny foot soldiers of the Sylves, named for the thorny crowns that protect their heads. They are bred for the defense of Sylvan settlements and the destruction of opponents. They are vicious combatants with fairly insubstantial bodies that tend to snap against heavy slashing weapons. Their porousness makes them virtually immune to missiles, however. Rhyzars â€“ Rhyzars are root beings capable of melding into the root systems and appearing far away. These strangely magical creatures are used by Sylvan forces to warp in and destroy the most vulnerable units in the rear of enemy forces with ruthless haste. Vinewhips â€“ Vinewhips are a valued breed of Sylve, effective at construction and possessing dynamic minds. They are also deployed in combat, where their long vines whip about in a violent fury. They work in teams to trip up, disarm, and strangle opponents, which they are capable of at a significant distance. As such, they cancel the first-strike ability of other units and ensure that they strike first. Dryads â€“ Dryads are mysterious living plants that predate The Awakening by millennia. They were tasked by long-dead gods with protecting the forests, which they still do with powerful magics. They now work with the Sylves, providing their only magical support, with a healing touch, the ability to purify the land, and the ability to warp wood. Their bark skin and ancient spirits give them a high defense and resistance. Ents â€“ Ents predate the Awakening by almost as long as the dryads, and were most likely responsible for it as a solution to their dwindling numbers and influence and the increasing exploitation of Arcanus' natural resources. Ents are wise elder trees of high status in Sylve society. When they take the field they are giants, tearing through most enemies with ease. It is a simple strategy that is nevertheless effective. The kind spirits possessed by Ents can also heal their allies in battle. Sylvan Lord â€“ The Ents realized that they had ultimately failed Arcanus, and so they made a creature more powerful than even themselves. This creature embodied all that was good about Sylvan-kind. Sylvan lords are intelligent living masses, equal parts warlord and siege engine. They can smash through walls as easily as they can destruct enemy forces. These wise beings have been a great success, and Ents have since sworn fealty to their creations. Living Vessel â€“ The Sylves take to the sea as a last resort, but when they do they use Living Vessels, which are sturdy, regenerating spheres of wood and vines. Living Vessels have a respectable carrying capacity, but their slow speed and pathetic combat worthiness make a Sylvan general think twice about going by sea in times of war. Very nice work on those units Lucern! I really should find time to play around with this editor. Workload isn't allowing it atm though. I'm thinking of working in 2 new races also... "Orientals" and "Primitive/Tribesmen"... As long as translation is advanced enough, I'll start to post some progress. Sounds compelling Singularity. I had ideas about both sorts of races, but for the Japanese inspired race, I couldn't think of enough to make them unique. For a primitive race, I couldn't think of how to make them remotely balanced. Not to say everything needs absolute balance, but what were your ideas about that? I had the idea of doing a D&D inspired thing...making 'troglodytes', which are essentially gray lizardmen. I'll be interested to see what you come up with. One idea I had was to make some new buildings that a limited number of races get, to add some variety for picking races that don't get to build that many structures. I'll say that most of my work didn't involve the editor past seeing what it could do in the future. It will, of course, but I was hesitant to add anything until I could be 100% sure that I wouldn't lose any of my work. A module or patching system would make all of this possible. If that's what you meant by translation, you should still be able to do the graphics work now, which is the most time-consuming (quite enjoyable though). As for me, I've been writing grants and such non MoM related distraction, so not much progress this month so far. I do, however, have 3 Gnome units ready: Gnome Militia, Gnome Illusionists, and Gnome Air Ship. They'll be getting five or six more, and will be finished next. They'll be technologically and magically inclined, without much appreciation for the 'direct route'. Instead they'll play a smarter game of distraction, illusion, and using Galileo style mechanical devices without putting themselves in as much danger. Edit: Oh, and thanks for the kind words Custodian. Last edited by Lucern on Thu Aug 07, 2008 10:56 pm, edited 1 time in total. oh, and primitives, they can be balanced very well. Just give them a very quick reproduction rate and extraordinary cheap troops+ mammoths, maybe? I could invent dozens of armies, but still I'm totally talentless when it comes to drawing (especially on pc), so those armies would end their lives in my mind only. Shame 'bout that, really. I've got a queue of 12 or so armies ranked by priority, but I'm open to ideas. I'm of the "the more the merrier" camp of strategy game players. More variety = more possibilities for play and contingencies for new and interesting strategic situations as long as care is taken to fit them into the world strategically and stylistically. I'd be happy to see what you've got in your mind if you want to write them down. Alternately, get a freeware program called Ultimate Paint*, get the graphics extractor from the main IME page, and look at what's there. Open a unit you're familiar with to see the size, and edit it - that's how I made my first unit. Most of my units except for the Sylves I base off of previous MoM graphics as a guide to size, shape, direction, and especially placement on the ground. I can't draw either, but working with a 35 pixel gnome isn't that challenging for me. Once you have your first pic done, with its palette all set, the next 32 can be done in a couple of hours, depending on the unit. Do that 6-9 times, and I'd call that a race. *Ultimate Paint is not what I'd call a sophisticated graphics program, but that's the point. It's a simple tool for simple graphics. It opens the graphics at the size they're supposed to be, and you can have like 15 images open at once without slowing down even my laptop on power-saver mode. With a more complicated program like The Gimp, you have to go and zoom all the way down to the size of the MoM pic and choose the single pixel paintbrush. All those things are default in Ultimate Paint. Several hundred years ago, three clans left th dwarven country and migrated far west, to the other side of the World's Peak Mountains. There, they found a land vast and rich in mineral resources. Having settled in, they started digging tunnels and creating mines. What they hadn't knew, however, was that this great land was not empty. Deep under the earth, a great daemon, one of the oldest and most powerful, awoke to the sound of drills and pickaxes. Having lost most of its power, it could not possess them instantly. Instead, the daemon started to corrupt their youngbeards and twist their minds. Two generations later, he assumed total control. Thus began the Dark Dwarves. These twisted cousins of the eastern dwarves have no bias against using magic, quite the contrary, they are masters of the dark arts. However, daemonic taint left their bodies weakened and their hearts courageless, so they try to avoid combat personally at all cost, instead using their slaves and horrible war machines imbued with dark magicks and souls of lesser daemons. Slaves - lowest of the low, puniest of the puny, worst of the bad - these slaves (most often greenskin), captured on raids, end their short lifes in mines or factories if they aren't chosen to be first ranks of dark dwarven army - or, to be precise, cannon fodder. They are quick to build, cheap to sustain, and quick to die. Taskmasters - often the biggest and most cunning greenskins are given the rank of taskmasters. They serve as the slaves' overseers, getting them to work by use of their whips. They tend to be as brutal as they can, knowing that one failure can get them back to slave life's misery. Engineers - dark dwarves are at least as good builders as their cousins. Dark Orcs - years of selective breeding led to creation of a new race, powerful and suitable for war. Dark Orcs are mutinous, but almost twice the size and triple the strenght of a normal orc. Sorcerors - dark dwarves, unlike their eastern brothers, are able to use magicks, and are powerful magicians. Deathcannon - this machine shoots rockets loaded with explosive material. It's the most basic form of dark dwarven artillery, but still a very powerful weapon, as it ignores armor. However, it is harmless in melee. Doomfire - made from brass and a captured fire elemental, the doomfire, as one can expect, is a flamecannon. Hellcannon - the most powerful warmachine ever created. Hellcannon is very difficult to build, as it requires a powerful soul to be bound into. However, in battle it is almost unstoppable, shooting daemonfire at long range, and fighting like a daemon, when the opponent comes closer. Juggernaut - a powerful machinery, the juggernaut is similar to a brass golem at first. But when a golem is a piece of animated material, the juggernaut is not only imbued with several lower daemons, but also controlled by a dwarf from inside. I like it Nehan. Dark like Warhammer, with more traditional orcs as well. I thought my goblins were going to be good at sieges, but these guys may well be the best. I wish you success. Yes, I based in mostly on Warhammer's Chaos Dwarfs. Wait! Is it possible to make buildings exclusive to a race? EDIT: Of course it is... Heck, it's 13:00 here and I'm still not fully awake.